Home » Conserve Youth With The Best Hair Transplant Treatments in Liverpool! Conserve Youth With The Best Hair Transplant Treatments in Liverpool! Are you looking twice your age because of your ugly baldness? Well, there’s really something more substantial that you can do other than taking expensive hair vitalizing spas or massaging hair growth oils. Hair Transplant is an incredible way in which you can actually get hairs on your barren scalp. 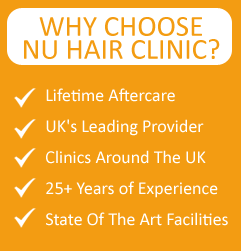 With our surgical experts in Nu Hair Clinic, hair transplant in Liverpool has become a completely reliable solution. With us, you not only get back your lost hair, but also your lost youth and self confidence. Technically, the basic task in hair transplant is grafting of hair follicles from a donor site of the body like the hairy zone of the scalp, to the zone of baldness. Hair transplant procedures can occur in two ways. One is known as Follicular Unit Extraction whereas the other is Follicular Unit Strip is also known as Strip Harvesting. Our hair transplant treatments in Liverpool is done by specialist and experienced surgeons for both these techniques. 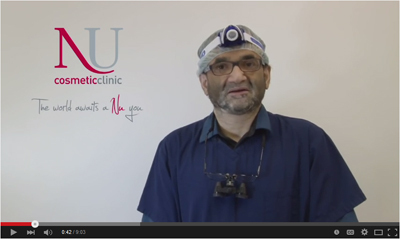 What is the difference between Follicular Unit Extraction and Follicular Unit Strip? Let’s find out. This procedure involves grafting of individual hair follicles having 1 to 4 hairs at the site of baldness at pre determined hair densities. In this process the surgeon picks up tiny punches ranging from 0.6 mm to 1 mm diameter from the hairy scalp area using local anesthesia. The punches of hair follicles are then grafted onto the required area using very fine needles or blade for puncturing the places where the graft is to be placed. The follicles are planted at consistent angles to make the hair growth look natural and realistic. The patient gets vital hair growth in the bald areas, leaving almost no signs of scar at the donor site. The same grafting logic is involved in Strip harvesting as in FUE, the only difference being the extraction of a linear strip of scalp skin instead of the unit hair follicles. The strips are then grafted at the site of baldness very carefully following a natural hair growth pattern. Unlike the FUE, this method may leave back linear scars at the donor site which is of course covered by the hair and not at all visible. Our expert surgeons use their instruments so artistically that the signs of surgery will almost not exist representing your thick hair mass as a natural gift from God! However, in any of the above treatments, the results will be achieved only after a 9 – 12 months time when the grafts will be accepted by the scalp to promote natural hair growth. We can claim to be the best amongst all hair transplant clinics Liverpool because of our flawless post operative care to yield unblemished results. The day after the surgery, the patient’s hair is shampooed to prevent the loss of the nascent inserted hair follicles from falling out due to accumulation of scabs around the follicle shaft. Semi permeable dressing sessions are executed on the scalp to help the healing of the wounds without any infections. Therefore, if you really want to eradicate your bald look forever at affordable price with guaranteed results, then surely you must resort to us for an ecstatic Hair Transplant in Liverpool!